Just a few miles but worlds away from San Diego’s beautiful beaches sits a wine country alternative that is giving Napa and Sonoma a run for its money. Baja California’s Guadalupe Valley is a stretch of countryside that runs basically from the border at Tecate (45 miles east of San Diego) down to the beachside hamlet of Ensenada, approximately 75 miles away. State Highway 3 is this region’s wine road and more than 50 wineries and hotel/B&B properties dot the landscape north to south. Guadalupe Valley’s history as a wine region stretches back to the first winery opening in 1888. Long known for stunning turquoise waters paired with warm, desert climates, Baja is home to countless tourist destinations and nature adventures. That warm, desert air and clay soil, combined with the on-shore breezes from the Pacific Ocean make the land in this valley very similar to both Napa Valley and Northern Italy’s Piedmont region. Typical selections feature bold reds and hearty grapes such as Cabernets and Merlots, along with light Viogniers. Even the popular Nebbiolo, a prize of Italy’s Piedmont region, gets heavy play here. Spain’s flagship Tempranillo grapes also find a home in Guadalupe Valley due to its similar climate to northern Spain. 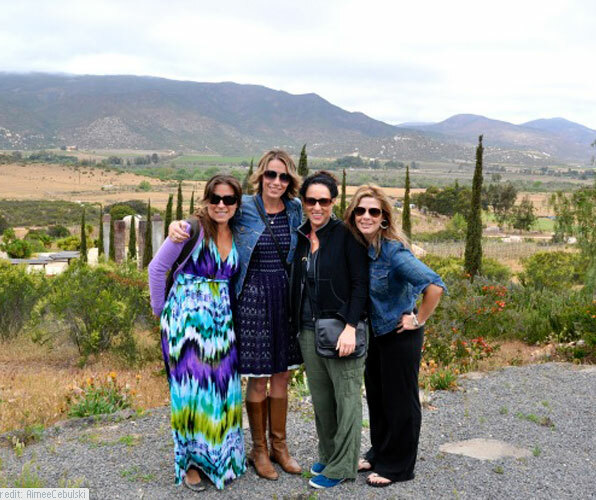 As a girl’s getaway, Guadalupe Valley can’t be beat when it comes to its easy access from almost everywhere in Southern California. No 8-hour drive up to Napa Valley nor plane flights needed. Border crossing is quick and easy at Tecate and Highway 3 is paved, lighted and well-marked. You can travel the entire wine road in about an hour if you don’t stop, but really, why would you? The point is to enjoy and taste as many regional flavors as possible. Original founder Don Angelo Cetto left his native Italy in 1926 and made the long journey to Baja California with the goal of bringing Mediterranean wine production to Mexico’s perfect wine growing climate – warm weather, cool nights, consistent marine layer and sandy soil. Now, three generations later, L.A. Cetto (led now by Luis Alberto Cetto) produces approximately one million cases of wine each year in three facilities and has become the largest wine producer in the country, not to mention one of the largest wineries in all of Latin America. No matter what you are craving, you are likely to find it during a stop at L.A. Cetto — Cabernet Sauvignon, Chardonnay, Chenin Blanc, Nebbiolo, Petite Syrah, Vinifera wines and Zinfandel. Don’t just take in the wine here; be sure to spend some time on the sweeping patio enjoying the stunning view of the valley below. One of the newest players in the valley (founded 2008), the partners committed to producing outstanding and memorable wine for a reasonable cost. The resulting winery, Las Nubes, “The Clouds”, seems to have succeeded with not only very drinkable wines but a lovely hillside setting. The production buildings are actually reminiscent of a Tuscan farmhouse and if you squint at the fields in the distance, you might imagine you are in Italy but without the jet lag! Las Nubes’ walls are actually created with stones from the local area. Current wine offerings include Nimbus, Cumulus and Nebbiolo, all named after cloud formations, Kuiiy and Selección de Barricas. Nimbus is a blend of Tempranillo, Merlot and Cabernet Sauvignon; Cumulus is a unique wine created from older vine Carignan, Grenache and Tempranillo grapes purchased from other growers; Nebbiolo speaks for itself. Kuiiy, meaning “cloud”, is a dry floral Chardonnay-Sauvignon Blanc. The latest addition, Selección de Barricas is a young, red blend that includes Cabernet Sauvignon, Carignan, Grenache and Syrah. As the valley’s oldest winery, Santo Tomás has a rich history. The winery has been around since 1888, but the family only recently opened a new tasting room right in the heart of Guadalupe Valley. Unlike some of the rustic buildings of other local wineries, the new Santo Tomás tasting room has a light, modern and airy feel. Santo Tomás’ signature Cabernet Sauvignon and Cabernet-Merlot blends finish with a rich and fruity taste and leave you ready for something to eat! Be sure to stop for sustenance and fill your stomach along your tasting journey! Mexico’s cuisine is as varied as its regions, and much of Baja’s flavors come from the sea. Bordered by the Pacific Ocean on the west coast and the Sea of Cortez around 40 miles to the east, many dishes feature fresh tuna, shellfish, swordfish and countless fruits and vegetables from the fertile agricultural districts. Mix those with traditional seasonings and sides like salsa, cilantro and guacamole, and you have a palette well suited to wine tastings. 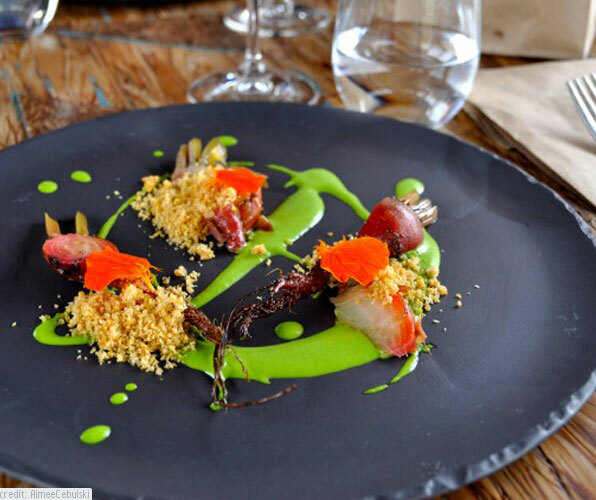 One of the most well-known and popular destinations for a truly gourmet experience is Corazon de Tierra (heart of the earth) at La Villa Del Valle (road of the valley). This B&B/restaurant property sits on a gorgeous plot of land filled with gardens and colorful grounds. The restaurant itself feels almost like an open-air dining room with large windows, exposed wood beams and natural fixtures throughout creating an al fresco feel. The Guadalupe Valley makes a great girl’s getaway alternative to the hubbub of Napa and Sonoma at a fraction of the price! Whether for a day trip or extended weekend, your taste buds will not be disappointed. Girl’s Getaway contributor Aimee Cebulski has been furiously catching up on lost time as a traveler after a five-year battle with fear of flying grounded her dreams of visiting far-flung destinations in her mid-20s. Now, she’s proud to have 52 stamps in her passport and considers each new one a triumph over fear. Girl’s getaways are always one of her favorite adventures! She’s worked as a freelance writer and photographer for almost 15 years and currently calls San Diego, California home. Her work has been featured in a number of travel, business and lifestyle magazines, web sites and photo galleries. She recently combined her love of travel, new cultures and writing with release of The Finding 40 Project, a book about women turning 40 years old around the world. Always encouraging her girlfriends to follow their adventurous spirit, she believes strongly in the eye-opening power of travel and can’t wait for her next destination, whatever it may be!